When a temperature and pressure (T&P) relief valve at a water heater leaks, it's usually a simple fix; just replace the valve. These valves cost less than $15, and replacing the valve is a very basic job - just drain some water out of the water heater, remove the discharge tube, and replace the valve. No big deal. Unless it starts leaking again. If a recently replaced T&P relief valve starts leaking again, it probably means that the relief valve is only doing it's job; it relieving excess pressure in the water heater. When this happens, the fix gets a little bit more involved. I'll explain. 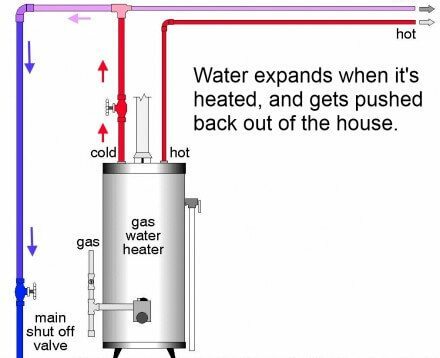 When a water heater heats up the water in the tank, the water expands. When this happens, the water typically ends up expanding back out the cold water inlet, all the way back to the water supply coming in to the house. The municipal water supply for the house acts as a gigantic expansion tank... and nobody notices. This is illustrated in the diagram below. What would happen if a one-way valve, or check valve, was installed on the water supply piping for the house? The water wouldn't have anywhere to go. 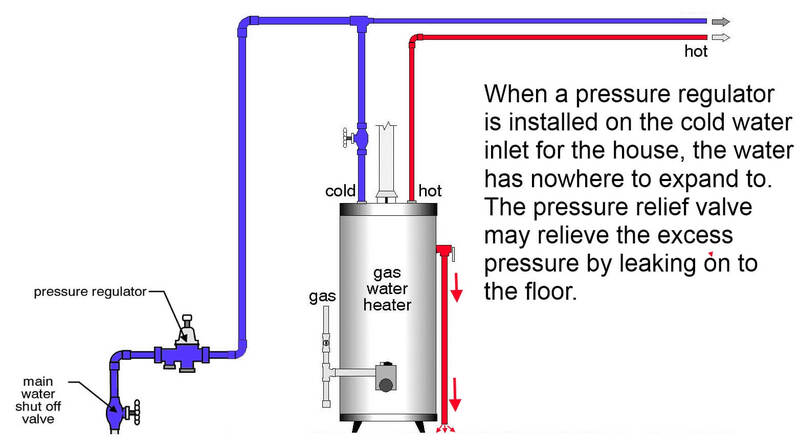 As the water heater heats the water, it expands, which builds up pressure in what is now essentially a closed system. 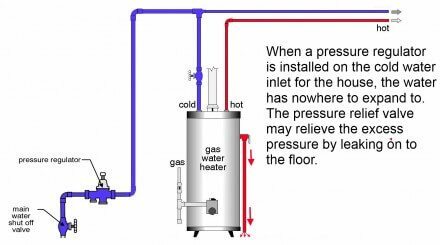 When the pressure builds up enough, the T&P relief valve on the water heater just does it's job and relieves the excess pressure by leaking a little water. In Minnesota, it's rare for a check valve to be installed on the water supply line for the house, but it's fairly common to have a pressure regulator installed. When the pressure from the water supply coming in to a house is too high, a pressure regulator needs to be installed on the water main, to prevent damage to the plumbing components in the house. The problem that these regulators can create is that they will act as a check valve; they'll allow water in to the home, but they won't allow water back out. This creates what is called a 'closed system'. 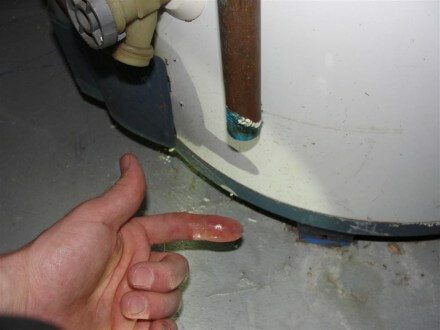 When this happens, the T&P relief valve for the water heater can leak. This doesn't happen every time a pressure reducing valve is installed, but there may be other problems that show up in the house, such as the toilet fill valves randomly re-filling toilets, or faucets chronically dripping. The Fix When a closed system exists on the water distribution piping in a home, an expansion tank needs to be installed somewhere on the plumbing system. 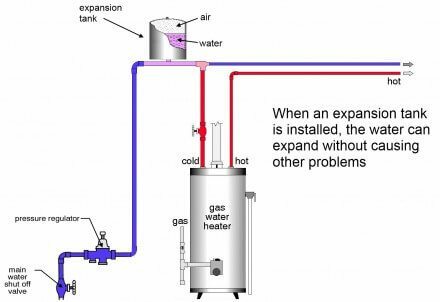 This is a fairly simple and straightforward fix; an expansion tank will give the water somewhere to go when it expands, and the T&P relief valve on the water heater will stop causing problems. Reuben. good info on the relief valve, I had to replace mine that was just worn out from old age. Very rarely do I see expansion tanks installed on water heaters. David - hopefully it didn't start leaking again, right? Reuben: I knew the expansion tank was important, but couldn't explain it. I have seen a lot of tanks in older homes in Bucks and Philadelphia. Thanks for a great explanation. You mean I've been heating my yard!? Who knew hot water expands! Actually, expansion tanks are required here now. And it's not a surprise. And for what they are used, they should last a good long time. Reuben good explanation, this is a situation I could run into, and now I feel more informed. Thank you for the information. I will bookmark this post and share with others. This was a great set of info, the pictures definitely helped me to get an understanding of what is going on in with your explanation. The illustration and explanation helps. Not sure how many homeowner knows about this information but certainly is useful. Reuben, great explanation! Your visuals diagrammed it very well. Thanks. Reuben, Your timing is perfect. Our relief valve has been doing exactly what you describe on an intermittent basis and the recommended fix was an expansion tank. I have found that if the T&P valve leaked and was replaced then it leaked again, then the water temp. is probably set way too high. Did you check this out? You don't need this kind of trouble when they should never leak in the first place. But things happen. Great information again, Reuben! I can't wait to see how this is explained at my next home inspection--I'm sure your explanation is better! Thanks for the information Rueben. Always good to expand knowledge on main home components. Always use a qualified plumber for any and all repairs/alterations to the public water distribution system. Clean drinking water is no accident. Thanks for sharing this easy to tip regarding replacing the relief vaule on the water heater. Will share it with my DIYers, this could help save alot of homeowners money instead of calling for service. I have seen more and more expansion tanks in newer housing, thanks for the information Reuben. 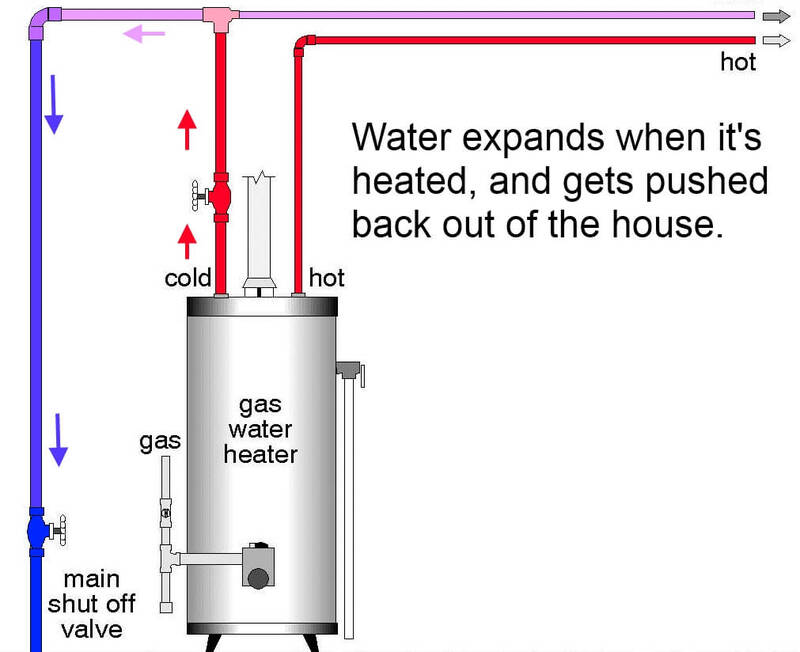 Reuben - thanks for the explanation on hot water heating systems... and a perfect diagram of my hot water heating system too! Reuben -- What an education! The diagrams are awesome as well. I know a lot more now.. Thanks for the well presented lesson. Anne - I explained this to clients many times, but I've always wished I had some diagrams to refer to. Jay - do you guys put pressure regulators or check valves on the water supply pipes coming in to your houses? Jennifer, Gita, Morgan, Mike, & Michal - thanks! 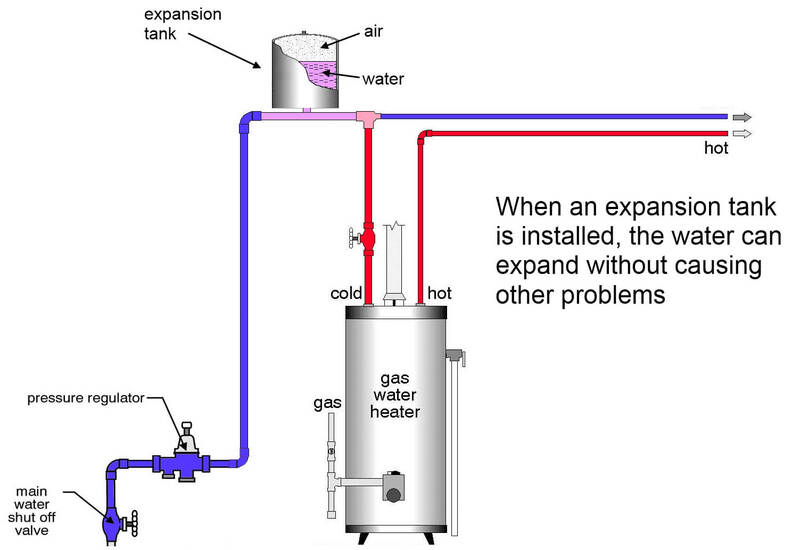 Liz and Bill - did the expansion tank fix your issue? Clint - this post isn't about any specific house or any specific inspection; just a concept. You should be able to crank up the heat on your water heater as high as you want to without having the pressure relief valve go off. Peggy - thankfully, this isn't something I run across all that often. Richie - those valves are important, but you're right, they can go off at any time. Chris - me too. It seems to be a standard item to add on new houses. Barbara - thanks. Those diagrams took a lot longer to create than writing the post did. Reuben, Just had this exact same situation yesterday. 95% of all the home in a closed system do not have one. The new homes do because they now enforce the code that has been there for a while. I would like to take this opportunity to thank you and all the inspectors that regularly post blogs like this. I AM NOT a handiman, actually I am all thumbs. I do, however, forward many of these to my son, who is fairly handy, and recently bought a home. He throughly enjoys reading them, and says he has learned alot about his house, especially since I couldn't teach him! Thanks guys!!!!!!!! Keep em' coming! Thanks for the great educational post. Most of the leaking releif valves I've seen were caused by water hammer. Most of the the newer homes here in Idaho have an expansion tank installed on the hot side to prevent damage from water hammer. Pressure regulator, yes, but no check valve. Haven't had it installed yet, but the valve had been replaced and continued to "leak". It's on the list of appointments to make. Woody - much appreciated, thanks! Laura - glad to help. Wayne - no kidding? I haven't heard of water hammer causing that issue. Interesting. Liz & Bill - I know how that goes. When this happens I call the Home Warranty company. Pay my deductible and let them worry about it. :) My wife does not trust me with tools. Thanks for a great post! I know that pressure relief valves are pretty common out here but expansion tanks are few-and-far between. Only rarely do I hear of a leaking pressure relief valve but now I know a little bit more of what to look out for in the future. Thank you. Hi Reuben, great post and explanation and excellent diagrams! Thanks so much as I see this occasionally on on inspections.